Shirtspace offers a free 30 day return policy. No restocking fees! Simply use the form to the right to submit a return request. We will then email you back with a return authorization number that you will need to write on the outside of the box and a free pre-paid return label. These instructions will also be included in the email. Items that have been altered or washed cannot be accepted. Please allow up to 10 business days for your credit to be processed after we receive it at the warehouse. Email us at sales@shirtspace.com or call us at (877) 285-7606 if you'd like to check the status. If you choose not to use our return label, you will be responsible for shipping fees. Shipping fees from original order will not be refunded. Refunds are for merchandise only, less your discount if you used one. Hawaii, Alaska and all non-contiguous orders are responsible for return shipping charges and will not receive a free prepaid return label. We do not accept returns from mill orders/drop ship orders including Augusta, Rabbit Skins, Alternative, Dickies, & LAT Sportswear drop ship items. These items generally say "CALL" on them on our website and we notify you before you make the order that they are non-returnable. Some items will drop-ship if no other warehouses can fulfill the order. Those drop-ship items are non-returnable. Our products are new and of first quality but if you should have a problem or defect please contact us within 3 business days of the time you place your order to make a claim. You can use the contact form below. We will then send you a replacement or give you a credit for the defective item. We cannot send a replacement or give credit if you contact us after 3 business days of the time you place your order. We begin processing your order as soon as you place it. For this reason, orders cannot be changed or cancelled once they are placed. You will receive a shipping confirmation e-mail as soon as we ship your order. If you need to make a return, please use our return form below. Our goal is to make all our customers happy, you will not be disappointed! Once your return request is received, we will send your return details to you via email. These details will include all pertinent information regarding your return, including your Return Authorization number to be included on your returned package(s), UPS Return Label(s) to send back your item(s), the return shipping address, and other important information. Use the email address you placed your order with. 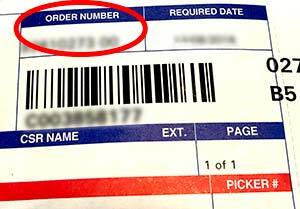 Use the 6-digit order number included in your order confirmation email or the 10-digit order number from your packing slip.